How we can work with you & the process to creating/designing your home. We often get ask when is the best time is to engage with us. Ideally earlier the better, when you purchased your vacant land, involve your builder, architect or draftsman and even when you first decide to start renovating. It makes for a better end result for you and your style of home. It is an easier flow for all involved to create amazing design elements right from the start and we always say It is never too soon to start your moodboards, tiles, selections fixtures and fittings even furniture placement as it all has an impact on your completed home. · Next is to set up a time to meet, you can call, email or DM via Instagram. We really are easy to approach, and this is what our clients say about us “How real, professional and easy to work with”. 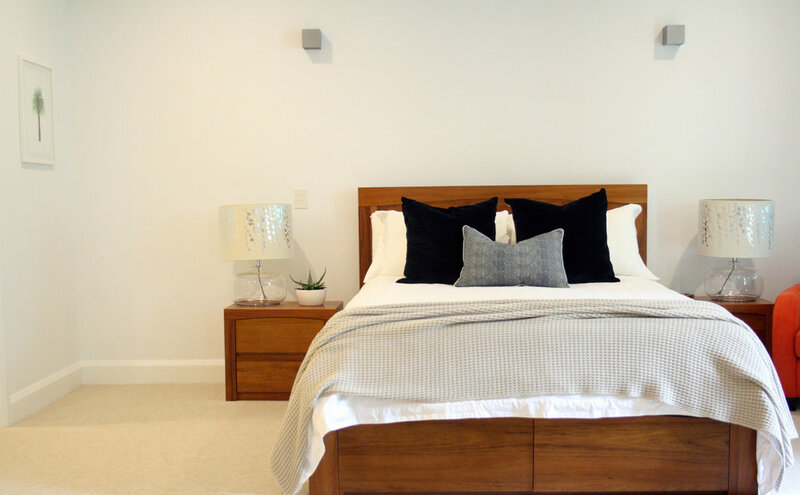 Once a time is scheduled in we can meet at your home or on site so we can start the journey of designing your home and it gives us the best way to see your location and space. 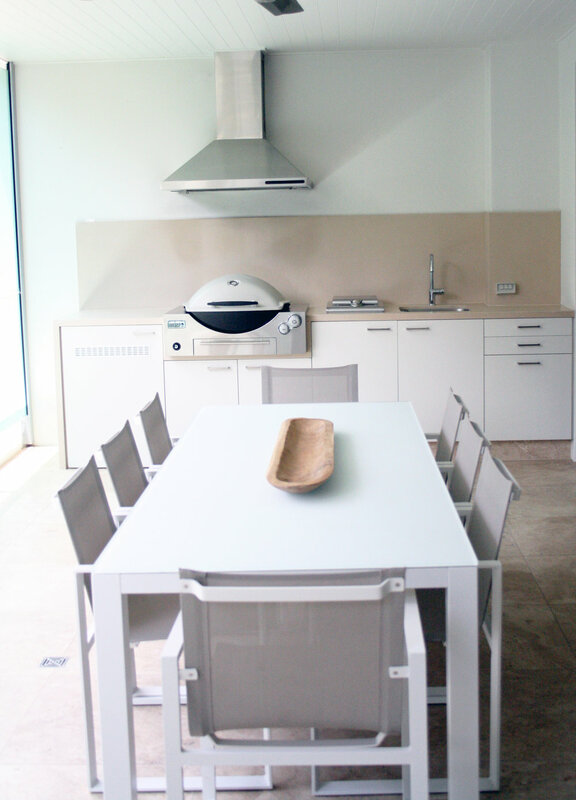 · This meeting is the best time be clear on what you want and what you don’t want introduced to your new design and home. Of cause we are here to guide and assist you, but we always love to see your pinterest moodboards, pages of magazines that inspire you. · After our first meeting we gather all your requirements and email you a personalised quote for the scope of works to begin. We know this is the best way to start the process so both parties are clear on what is expected in the project process and we understand everyone has individual needs which requires individual quotes. Once you have approved your quote we ask for a deposit to start and remaining funds are paid on the completed scope of works. We are here to create amazing spaces for your home, we pride ourselves on unique design elements, personalised spaces and creating a vision. Sometimes projects can take over a year to complete from design to turn of the key to your newly designed home so our relationship is special to us. 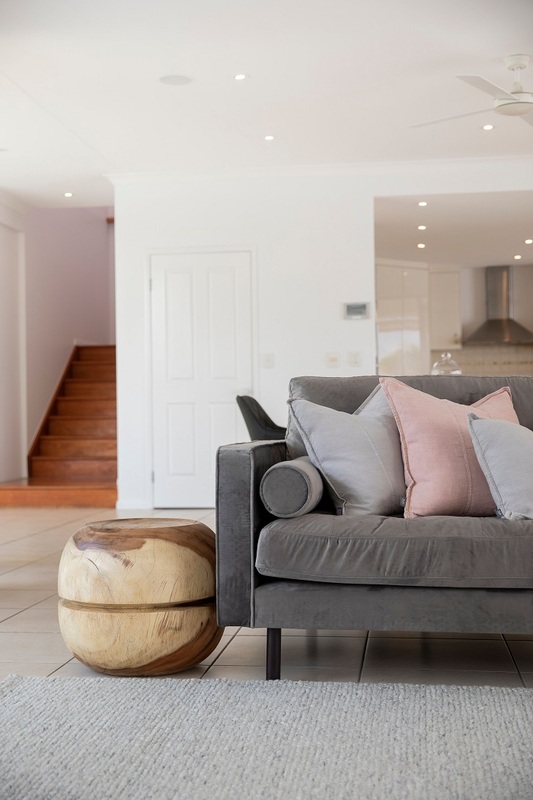 Step inside Renee and Travis’s new family home in Noosa Heads, this house certainly did not look like this 12 months ago but the location, massive potential and big block ticked all the boxes for this family. The family had a style that not only needed to be robust for the family, stylish but easy to live in. This project started for me over a year ago when Renee contacted us through Instagram to meet with her and her family to start designing a new floor plan and extension of a second living, laundry, and master bedroom plus ensuite and add entry mudroom, butlers pantry & pool. This old and new space had to internally and externally marry plus add new design elements and details for a fresh interior look. Remodelling of all internal spaces and bringing all the areas together one of the most exciting part of this project for me plus planning all the all the materials, colours, kitchen design along with fixtures and fittings - with the whole design elements , I was in designer heaven plus I must say Renee and Travis were an absolute delight to work with and totally trusting in me to bring their dream home to life. 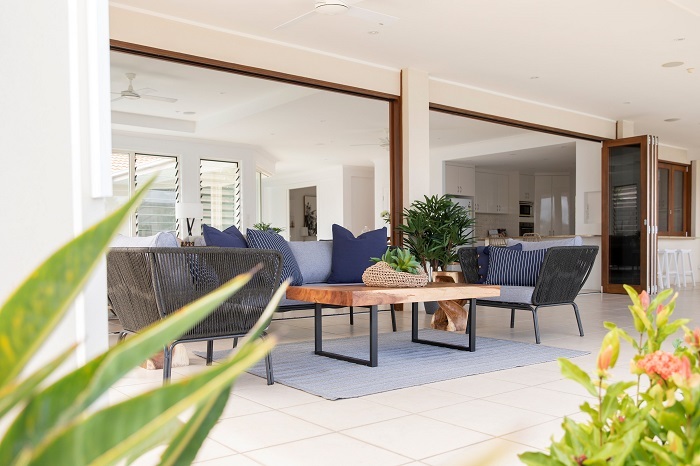 Once the design and aspect of the home was set, Jason from Recom Building had the challenge to bring this renovation to life, With only 4 external walls remaining, Jason and his team completed this amazing home with so many details to cover, this renovation was a success. 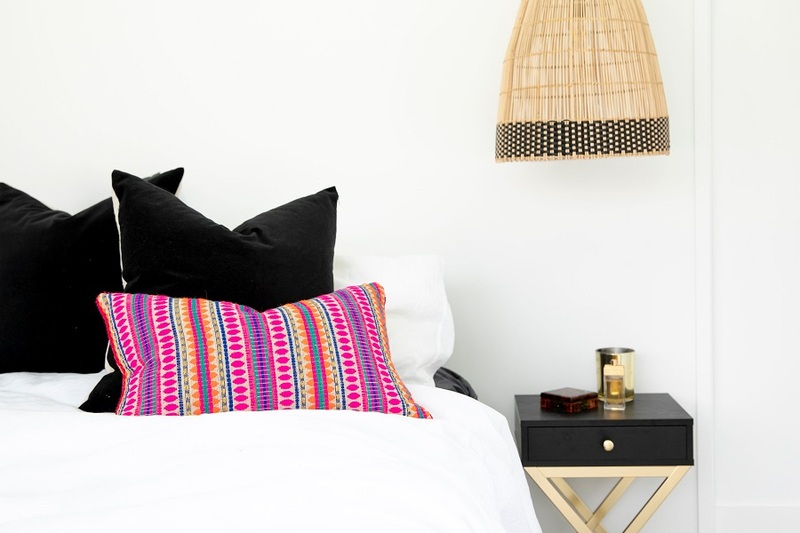 Even with an overall monochrome feel, we wanted to bring in personalised colours into the bedroom. The owners wanted each room to suit not only their personality but their children. 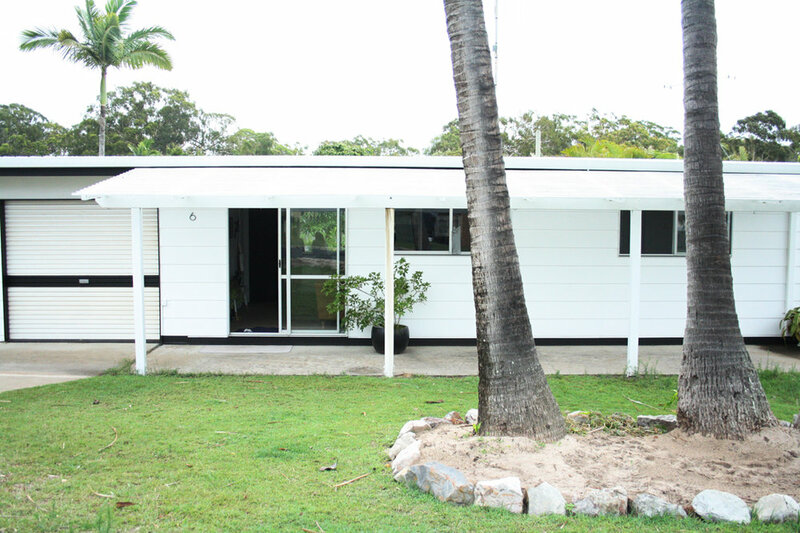 Welcome to our Palm Tree Lodge – my family’s renovation project at Rainbow Beach. This has been a dream of ours to own our little seaside getaway, a place where we can make fun memories for our girls and a home away from home. Away from routine, schedules and a place to re-charge and re-connect. Oh plus Shannon (my husband) & the girls surfs so…. Bingo! Surf shack! Design concept of black, white and Navy. 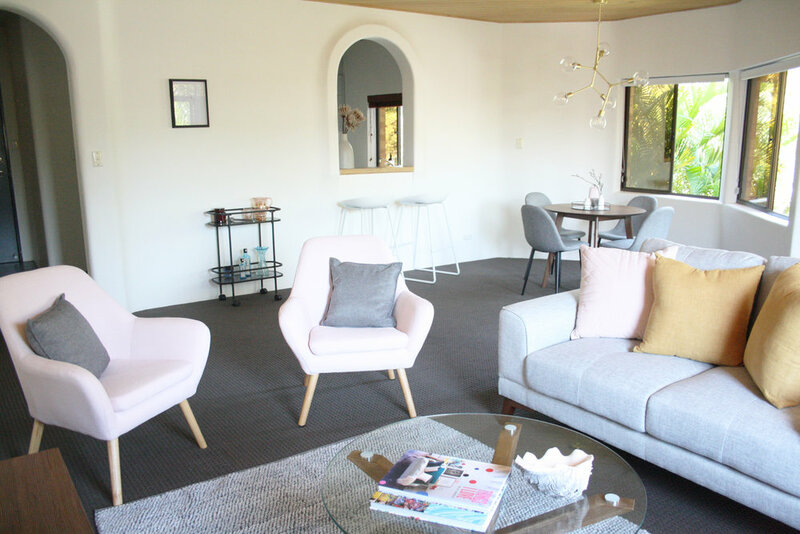 My core values for this home was it to be inviting and relaxing space and that we could all feel connected. I didn’t want the home to be all about the TV but more about the outdoor area and connection to the kitchen which is always the hub. I wanted the spirit of this holiday home rise again into the modern now. - We could not have pendants from the ceiling, so this offered for myself to look at alternative lighting designs. 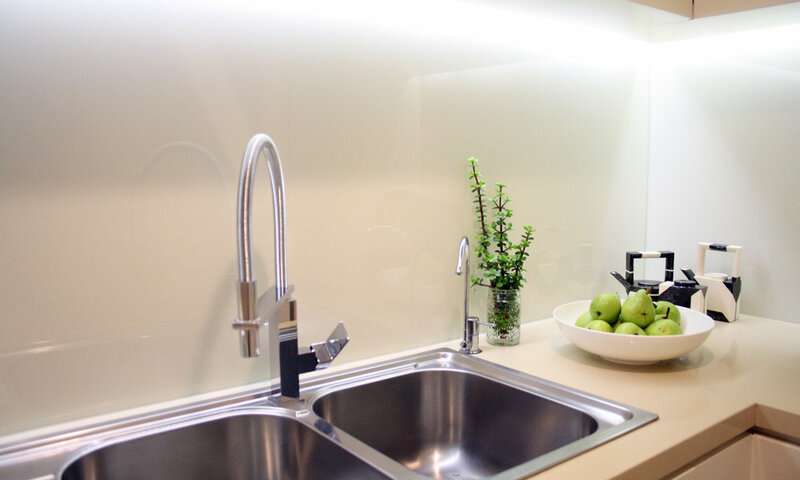 I love Black wall ‘Arm’ light over the kitchen bench and all the wall lighting that can be directed to different areas. One of my favourite features. 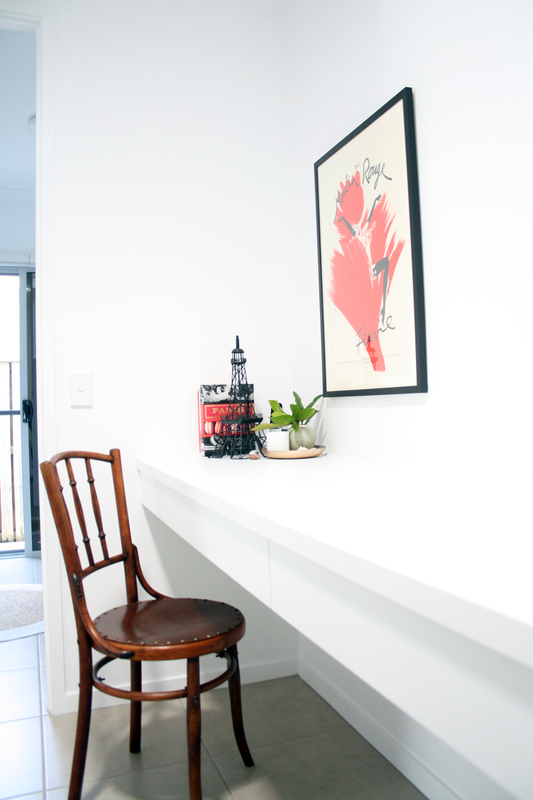 - As the home did not have any space for a traditional ‘dining room’ I designed the drop down bench/table that is the same height as a dining table. I added 2 chairs and 2 stools so the stools can be tucked under while in the kitchen. 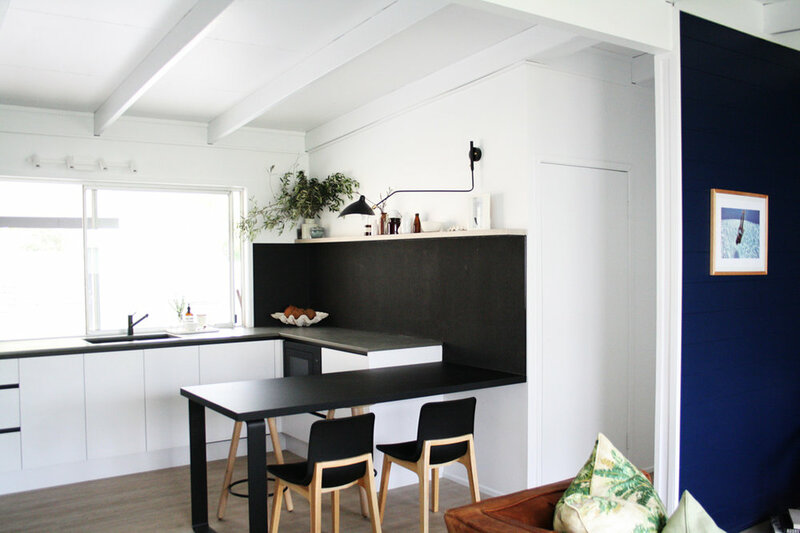 - In the kitchen I didn’t want the space to have overheads on both sides, so I love the long but narrow timber shelf to add interest and also I can style with different items and it be forever changing. - Creating the VJ panel wall in the living space to give the home some charter and getting so many shades of navy until the vote was British Paints Kara Sea. Perfect really. - As the kitchen needed some texture and substance. 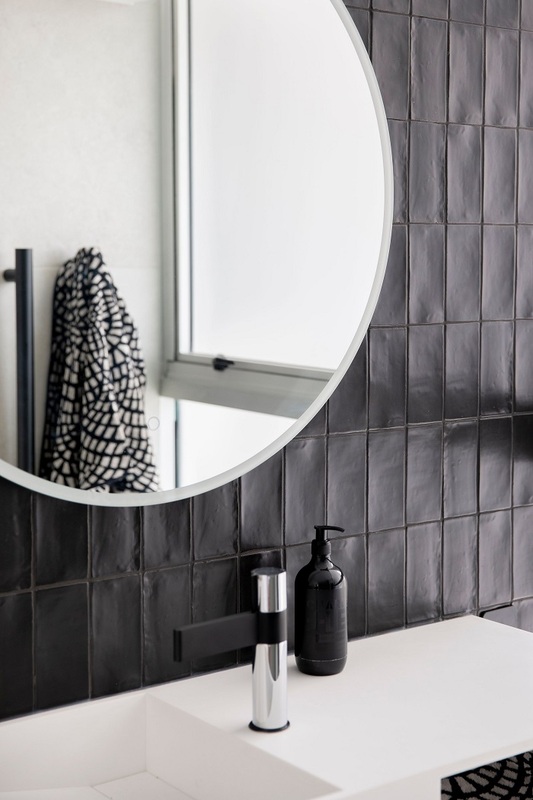 White cabinets and tiles would have been the safest design choice but I wanted to add the surprise of adding mini black herringbone splash back tile with concrete look bench top with black cabinets feature wall. - The bathroom is small layout but we kept all the internal walls. So I added a tile feature around the custom vanity plus a glass shower door. I wanted thicker black grout for more of a punchy impact ! I love it as it hits you in the face as you walk into the bathroom but my favourite details are the black penny rounds on the floor. And now the Thank You’s to our professional team, we couldn’t have done this without you on 2 months time frame. Craig our handyman/all rounder support and for being on board for all our crazy ideas. Plumber – Laurie - went over and beyond this job description, this job was tricky! Electrician – Jecico, Belinda and team from Next Generation Electrix Gympie. Amazing service and thanks for everything. 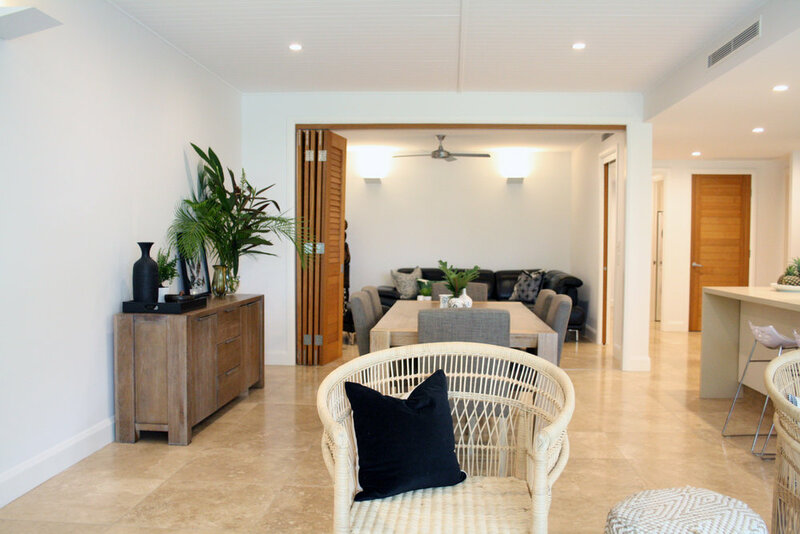 Tiles supplied – Coolum Stone and Tile Studio. 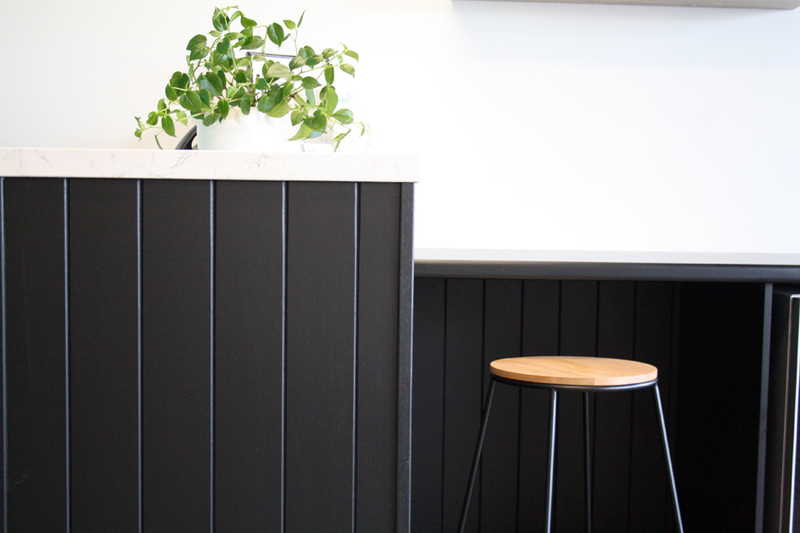 Thanks for the instore coffees and ordering in my herringbone tiles. My fav feature. 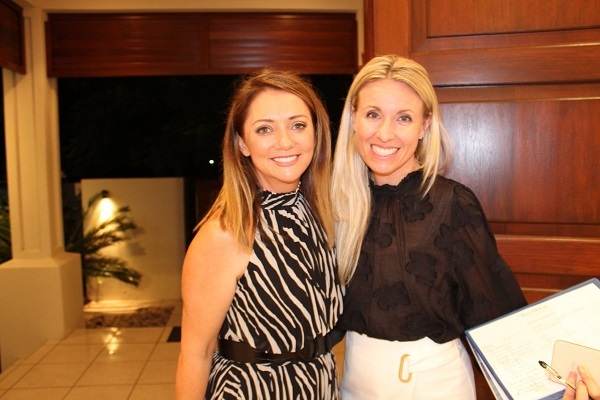 Tapware – Nicole and Carman from Noosa and Gympie Reece Plumbing. Absolutely the loveliest people to deal with ( I could give you a hug right now). Floors by – Floor Zone Gympie. Friends who helped us with demolition and chainsaw action, we can’t wait to celebrate with you at our cocktail bar. And, as I just finishing the styling on the weekend I must admit I had 1 massive melt down (bound to happen) and that was because I couldn’t figure out the coffee machine ! YEP.. It’s the small things that push you over the edge! We came all this way with me not loosing it, butttt it was bound to happen. (Sorry to my girls and my husband). Now it’s all ‘ready’ for us for our first Christmas and for you all to enjoy as your next holiday destination with your family and for you to make special memories and relax. 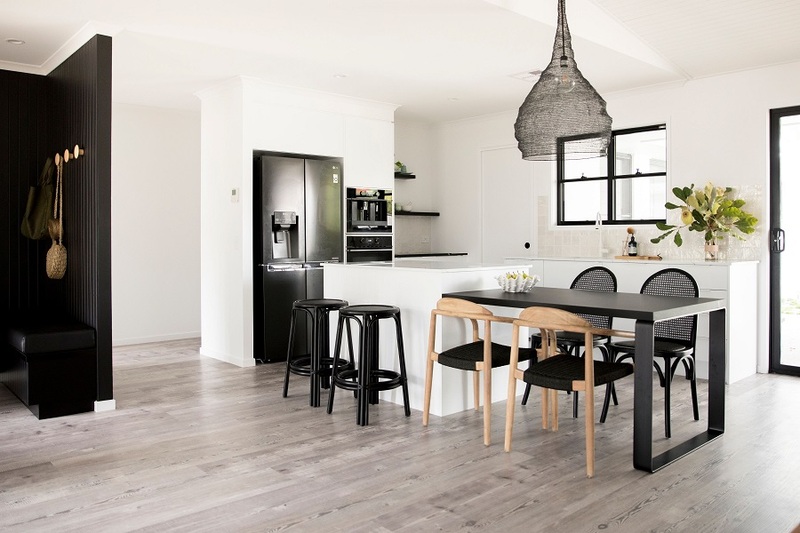 Thinking of renovating or re-designing in 2019? We would love to help you as we know first hand the highs, lows and have the team that makes things happen. Just before you go, thought you might like to view the home before images and see the transformation created. Secret time - I love old homes, the ones with beautiful details and segmented rooms and high ceilings. Yes, a lot more work to renovate but to me they give you more joy. The feeling of that lived in comfort and the best is you can still add your modern elements in. 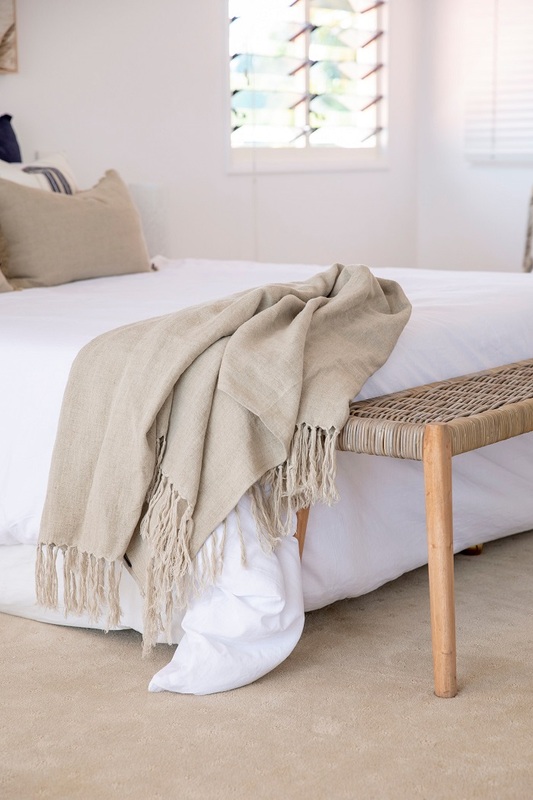 So when my clients Adam and Trudy asked me to style a stunning charmer For Sale, of cause it was all about how the old meets the new and also to keep in mind who will be the next family to enjoy the space. 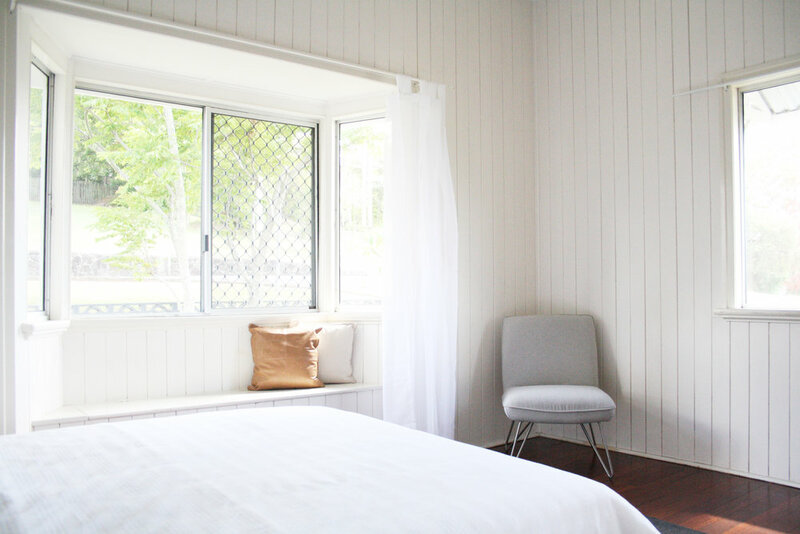 One of my favourite elements is the traditional window seat in the master bedroom, dreamy! Update time for this Noosa Unit. 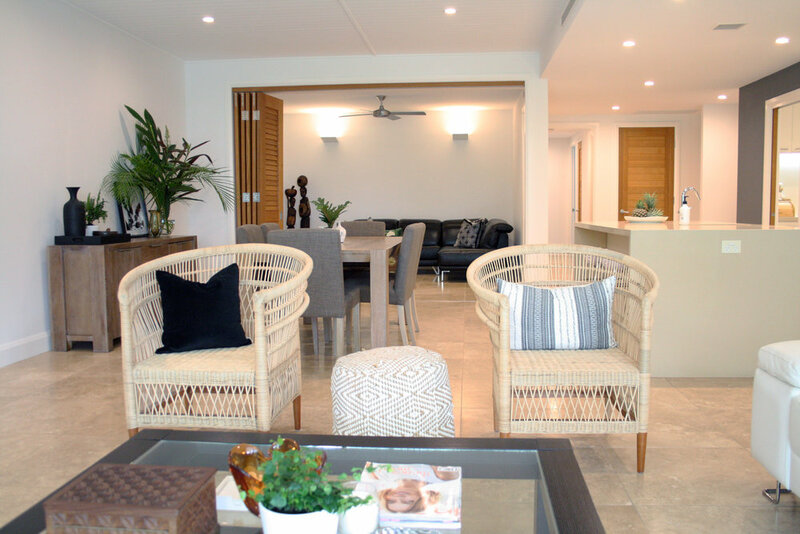 This roomy and spacious holiday unit needed to embrace the Noosa lifestyle and have a relaxed feel added to the interiors. Our style solutions for this unit needed to fit the brief plus offer statement items and tiny details to achieve smart space style ready for Adrian from Reed and Co. to place this Unit on the market and with the current owners’ excitement for a new look and the eye for the future, this was the start of a stunning result. 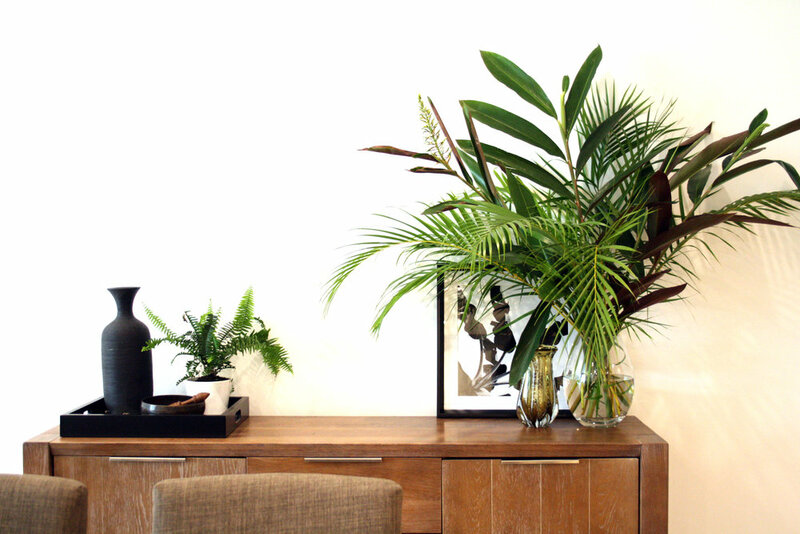 - Mood board of a luxe tropical relaxed style. Always plan for the style you want to achieve, and a professional mood board is always a great way to start and the clients loved seeing the new style. - Adding more light into the space and making each zone like it is connected unless you wanted to close it off for more privacy. - De-clutter, De-Clutter, De-clutter. An absolute must for this transformation. As you can see by the before and after images, we removed extra-large sofas, chairs, bookcases, large art, heavy framed mirrors, TV units and the pendant light. The pendant was too small, and This was replaced with downlights, so the room would flow. - Painting over the ‘beige’ & ‘brown’ walls! Yes, this was a high priority on the ‘new look’ list. Now it’s a fresh Dulux Lexicon ¼ strength and the kitchen feature colour of Dulux Guild Grey. 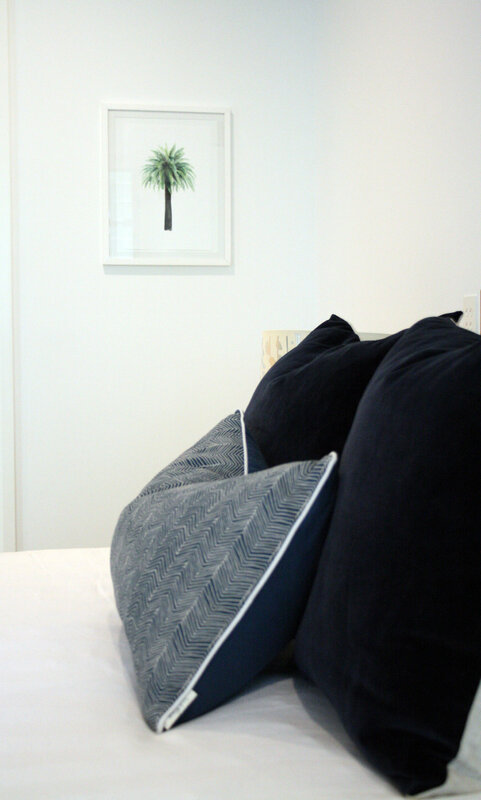 Art is another way to define a style and with local talents such as Cass Deller that we used for the master bedroom Palm Tree art and a perfect detail for our look. 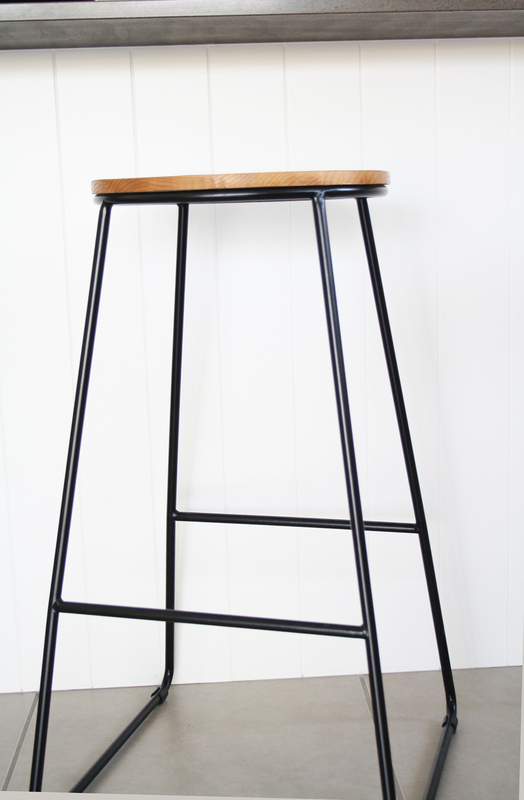 As you know we love sharing the before look with the finished look, see below. 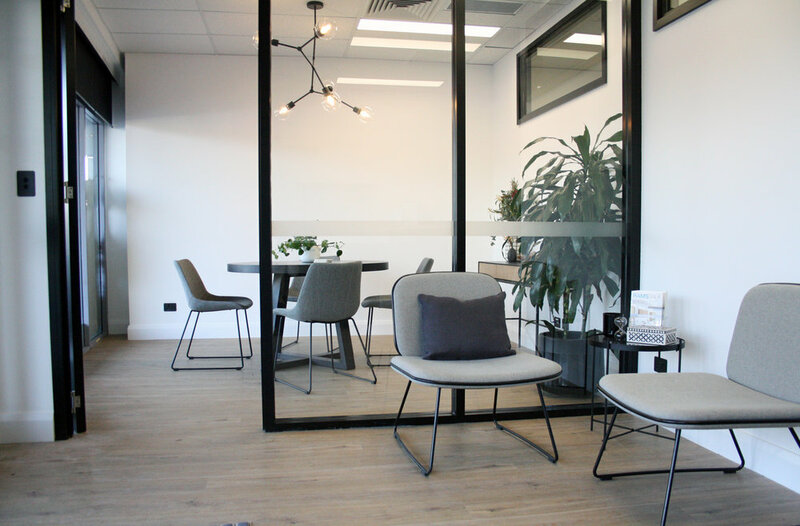 The space allows constant contact with others but also allows activity In different spaces, the owners love it and laughed that they may not sell it any more as they love it too much! Only joking Adrian. Thanks for stopping by, we just love to share our projects and our special client’s new homes and spaces. A stunning 80’s walk up in a group of only 5 units has all the vintage quirks but also has water views and the best part a short stroll to Hastings Street, Noosa. Meeting the current owners at their much loved holiday unit, the time had come for this little family to move on and sell. 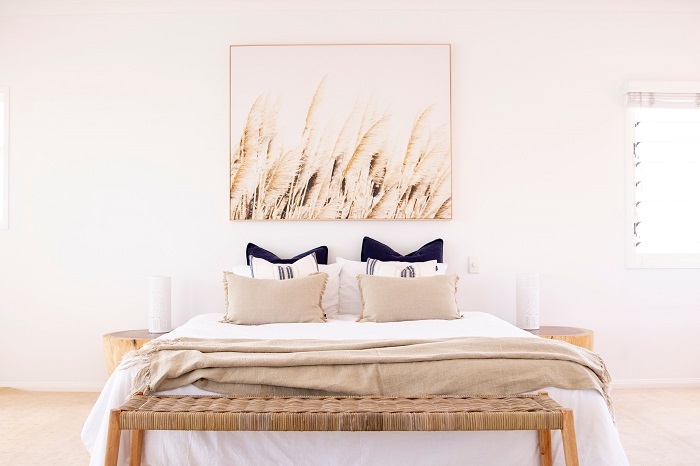 The owners brief was to create something cozy, not beachy and nothing white and stark for the unit! We also had to update the kitchen, tiles, bathrooms and lighting. This is when the fun starts for me! 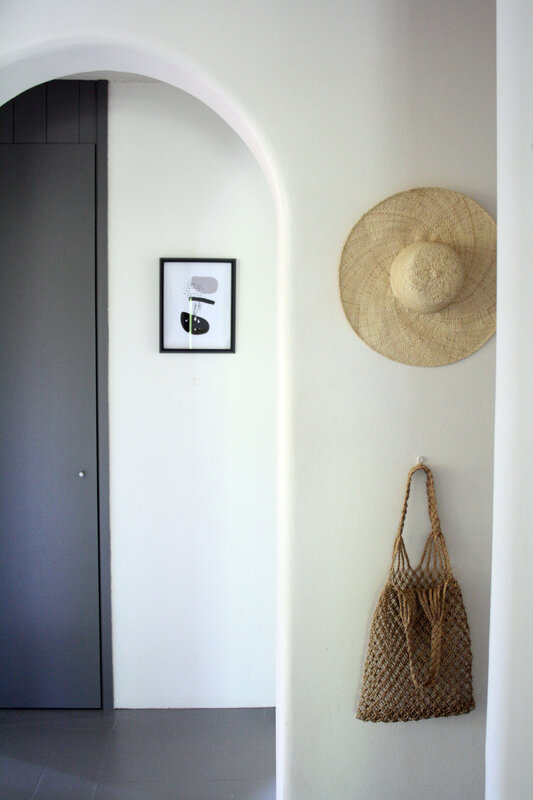 I felt the open spaces had to work harder to offer and give a softer touch of character just like the arch ways offer special features too. The choice was to go with the colour palette of grey, dusty pink with a touch of yellow/ gold for the living space. 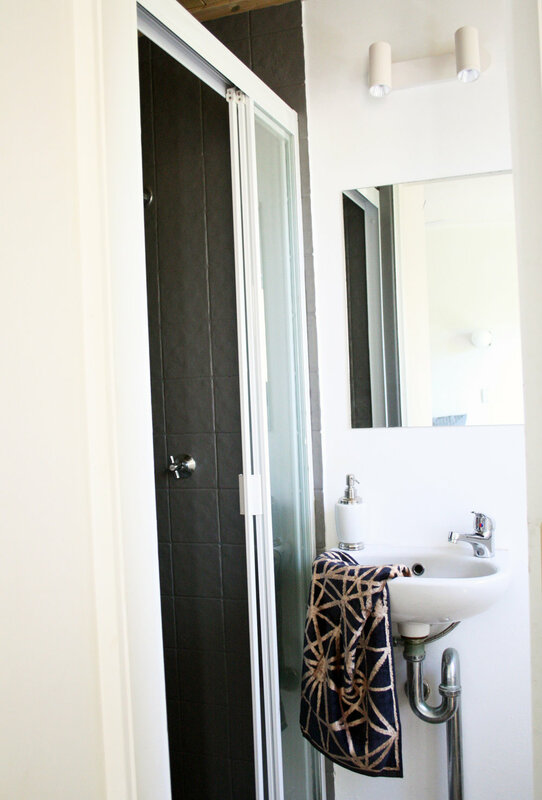 The large master palette was Garnet with touch of blush pink and add grey into the master ensuite to merge with the already garnet colour floor tiles and shades of grey in the 2nd bedroom and ensuite. Funny enough, the inspiration for this makeover came from the yellow kitchen sink, timber ceiling features and the garnet colour floor tiles in the ensuite, It just need a modern touch. 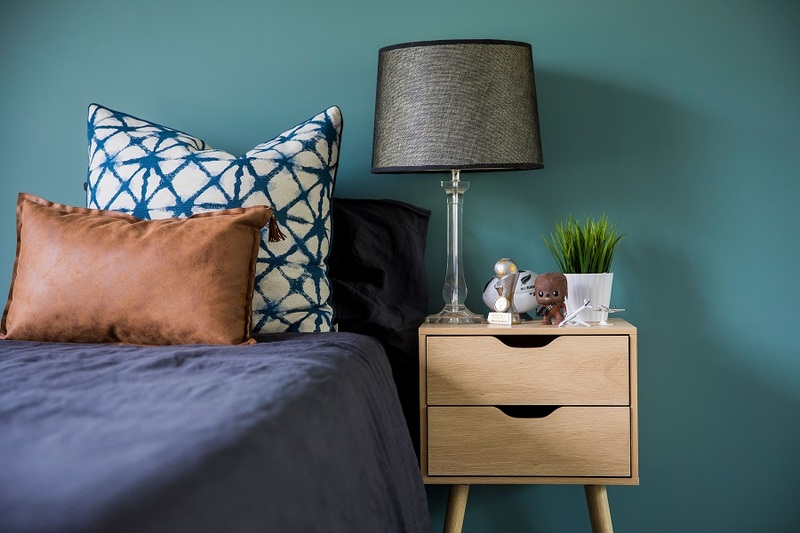 OVER Sharing and QUICK tip – Sharing the befores and afters below gives you an overall look of how important it is to be clear on your style and stick to it. - Moodboard it! I love to moodboard and It gives the clients an overall look and feel the vision in my head. Even creating from scratch, it offers an idea of colour palettes and certain items that will be purchase. - Order all items, get delivery and unpack. 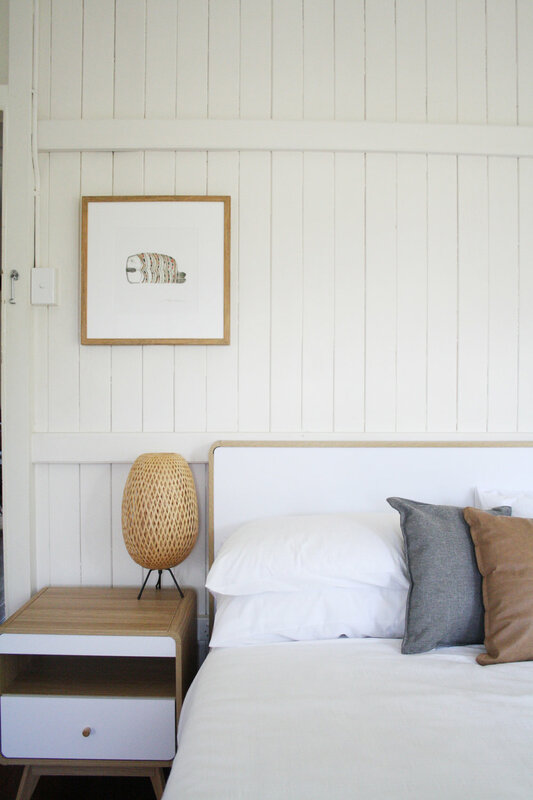 My favorite item and star performers in this space is the dreamy gold arm pendant light from Noosa Lighthouse, the art from Yorklee Prints. 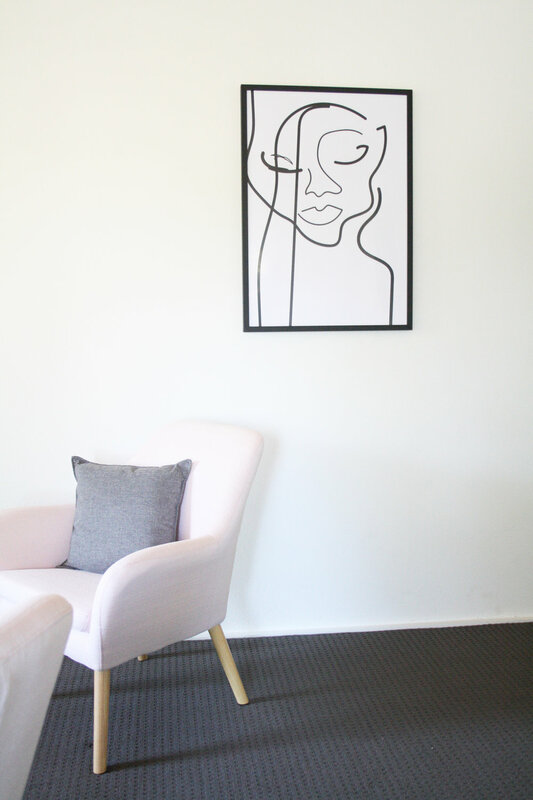 I am a massive monochrome lover but I simply adore the garnet and blush pink in the bedroom with the art. Not only are the owners are super happy with the finished product, it is now ready for market for the new owner to love too. 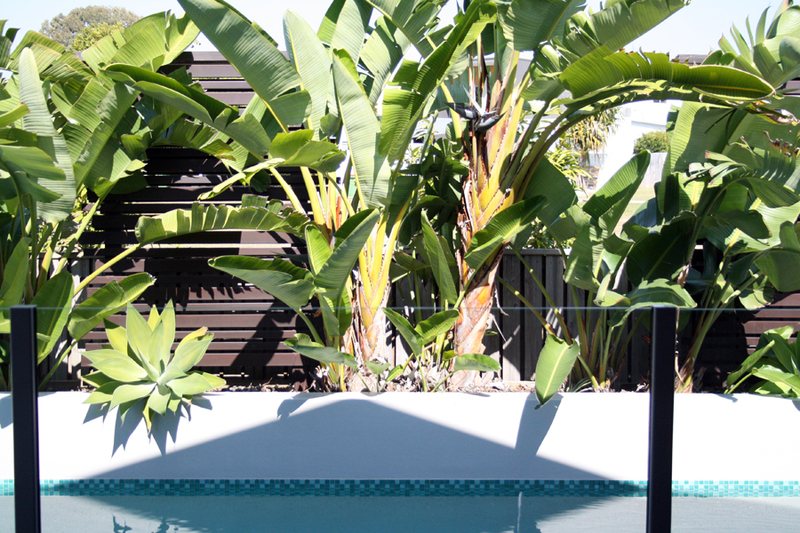 If you are interested in this property it is on the market with Noosa Agent Tom Offerman Noosa. Once again thanks for joining me here and can’t wait to share the next home we have just completed the sweetest Queenslander in Gympie. I know office spaces can be ‘boring’ and certainly a lot of them are, no design, no feel, over lit and under styled. 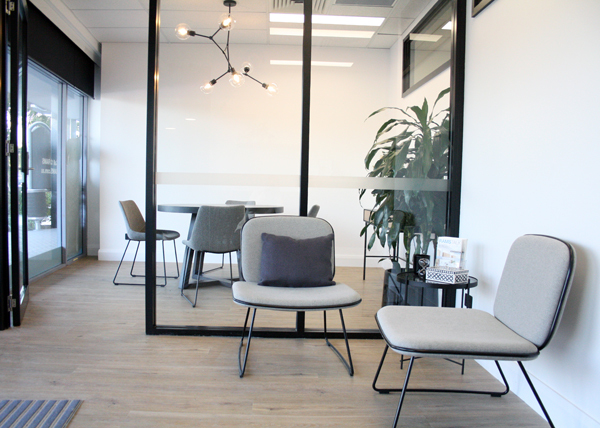 Well not for this new Rams office at Burleigh Heads on the Gold Coast, the new owners of this office are certainly a power house couple with a real passion for finance (yes, this is true!) 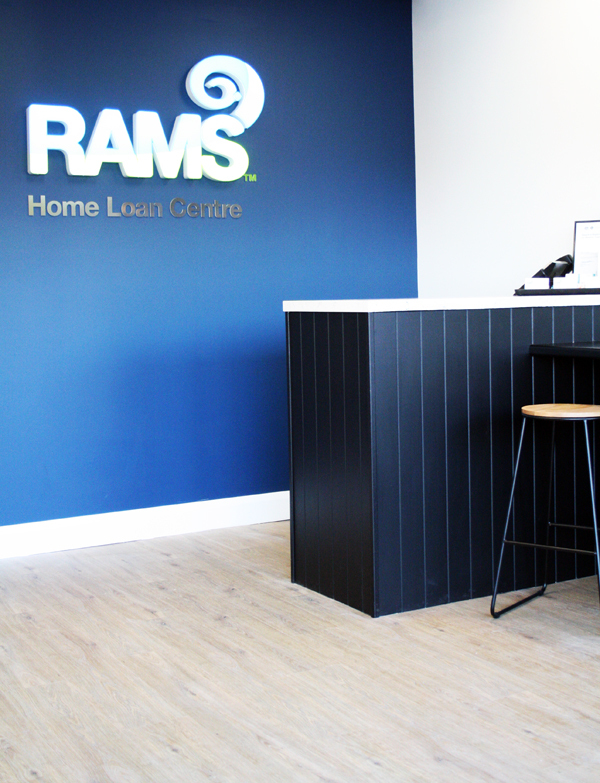 They love numbers, homes and are big on customer service so when they got the keys they wanted to re-create this space that is comfortable, stylish and feel like their customers are sitting around their own dining room table to chat all things finance. After only 1 weekend this couple ripped out all existing walls, ceilings and flooring. PERFECT! What a fabulous starting point for us. (check out the ‘before’ images on instagram). After meeting with them on site, we design new layout, new front space, colour choices, accessory purchases, new bathroom materials and a created a furniture package. Oh did I mention they had a 3 week deadline ! So this certainly was a quick decision making project and to work extremely quickly for all purchases. We all agreed that the front reception should be welcoming, light industrial vibe with stylish touch, light and airy but they also needed it to be private for customers and staff meetings (with the addition of black blinds on the windows) as the spare wall in the front office needed to be blank for projector information flashed onto the wall. We needed the round table to be large to spread out paper work but also gives the room more interest, the lighting we wanted as a ‘hero’, which we are so in love with. In the waiting area we wanted it to be more comfortable for customers to wait but also extra seating to sit up at the bench to read over documents etc. 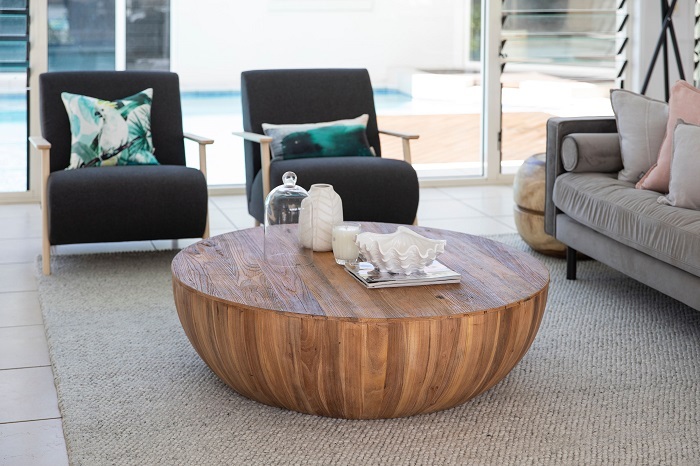 With this strict time line (work well under pressure haaa ) all furniture was purchased through Globe West who not only fit the styled we wanted but made the delivery on time (thanks Sarah), all lighting from The Noosa Light House, who delivered in a flash! With all other items and material decisions made over the phone and on the spot with the owners. 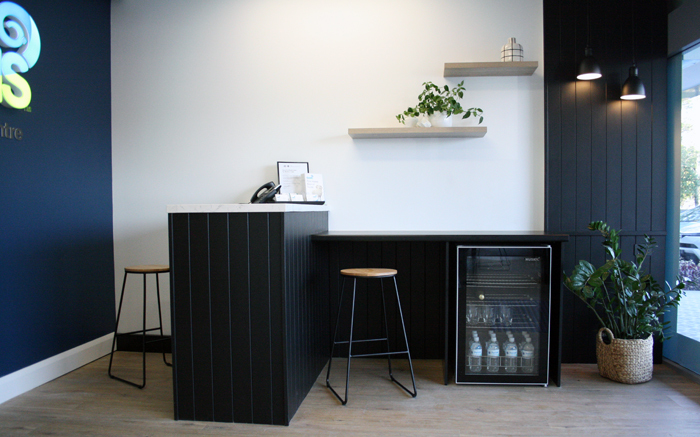 I love how this all worked out including the bar fridge at the front reception area. 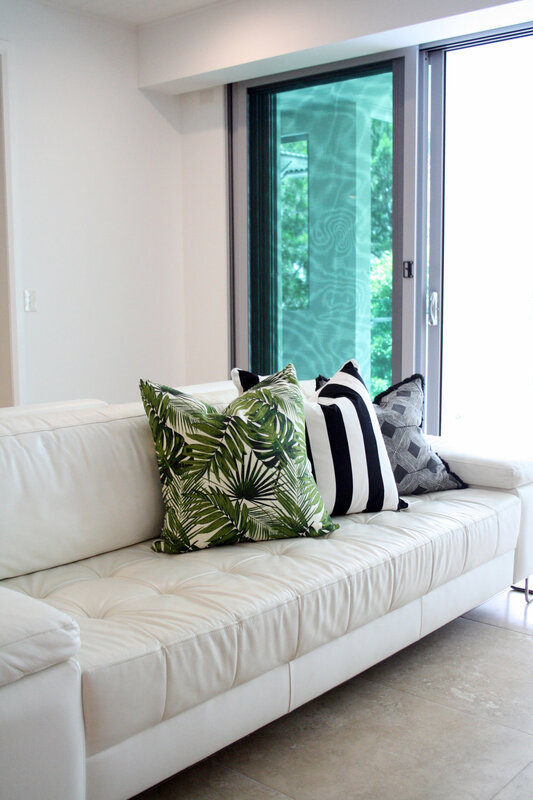 Even with a short time frame, finer details were not missed plants, homewares, cushions for a extra ‘homely’ look. This project was fabulous to work on, I love the quick decisions, clients lovely text messages to create the look and of cause travelling down to style the space. 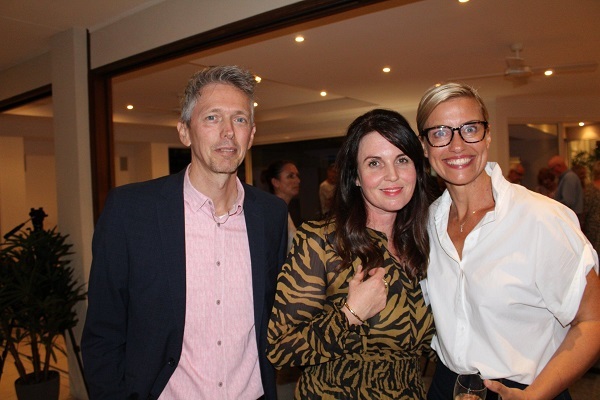 So, I can stay this wholeheartedly, if you need someone to look after your finance Lischelle and Todd are your finance team. This couple are amazing and love their new location, a home away from home. What a fabulous place to come to work and check out the back office space too, our clients are extremely happy and we can’t wait for the opening party. 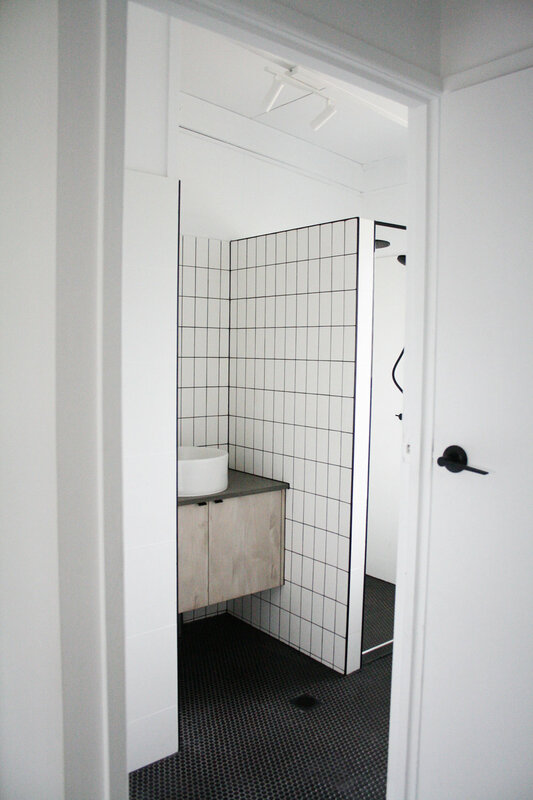 Now for the photos, check them out below, even the tiling in the bathroom we can’t get enough of! 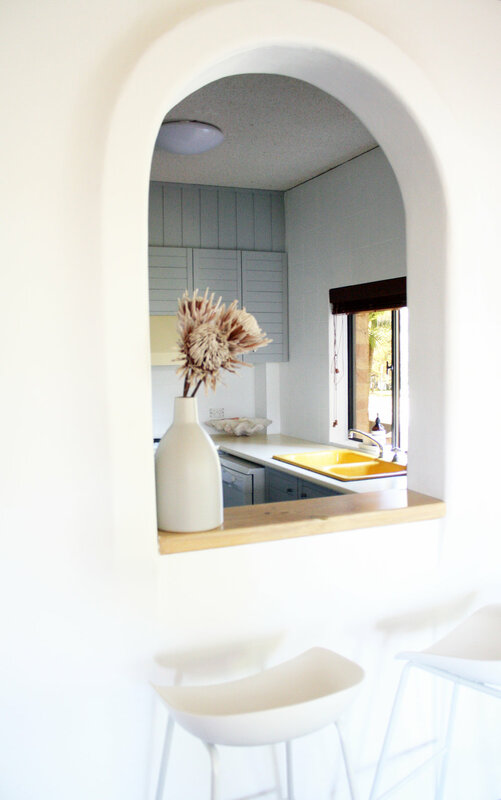 Jenni and her husband have been in their Marchooydore home for over 8 years and her vision was whiter and lighter colour scheme with more of a relaxed living vibe. Perfect for this couple who have retired and live more of a relaxed life style (I know Jenni will laugh at this comment, as she certainly has a full calendar, it’s only “work free”). After the consultation, Jenni and I worked on a plan to start her project with a decent ‘list’ we created a moodboard to grab details she wanted to see in her home. 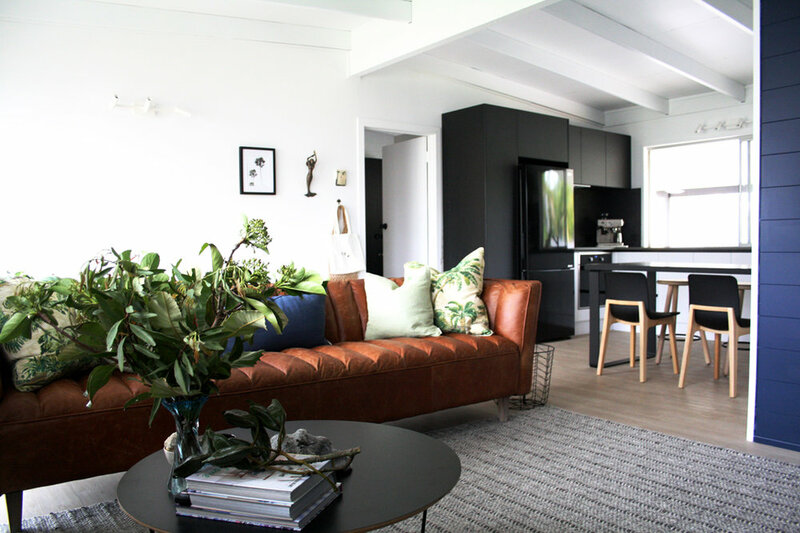 Choosing a new design and details for your home can be scary and make you feel uneasy but I loved the way Jenni embraced all the new ideas to create the perfect look. It was great to hear Jenni’s updates and excitement as each listed item was achieved, we made a great team! 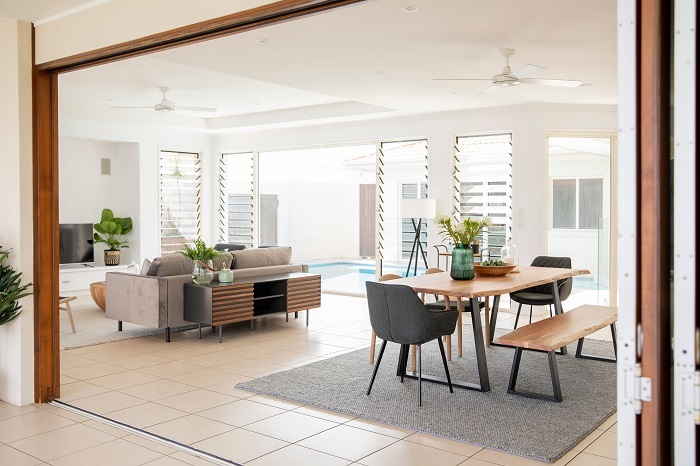 To create that breezy and fresh sanctuary, we wanted the areas to work all as one, so the kitchen, dining & TV space leading out to the pool to align with lifestyle it offers. The walls painted Dulux Lexicon ¼ strength white and remove the ‘green’ feature behind the TV as we didn’t want that be the focus of the room. The large art was re-placed into the spare bedroom and a selection of muted coloured art now hangs to offer an over-all feel. New cushions, rug, dining chairs, pendants & bar stools added to create the space. 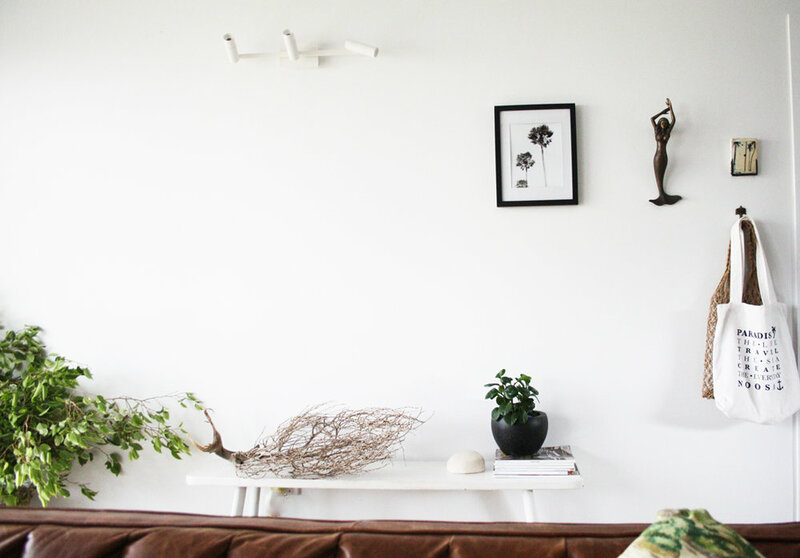 We also re-styled Jenni’s favourite bits in the spaces as this is what makes a house a home, collectables that are on display that make you happy. In this look we added textured elements such as the pendant lights, VJ panels to the front of the island bench and drama of black tap & handles for a contemporary feel. The front kitchen doors where replaced with a fresh white colour and the bulky range hood was replaced and extra top cabinets added with handle free, for a seamless look. 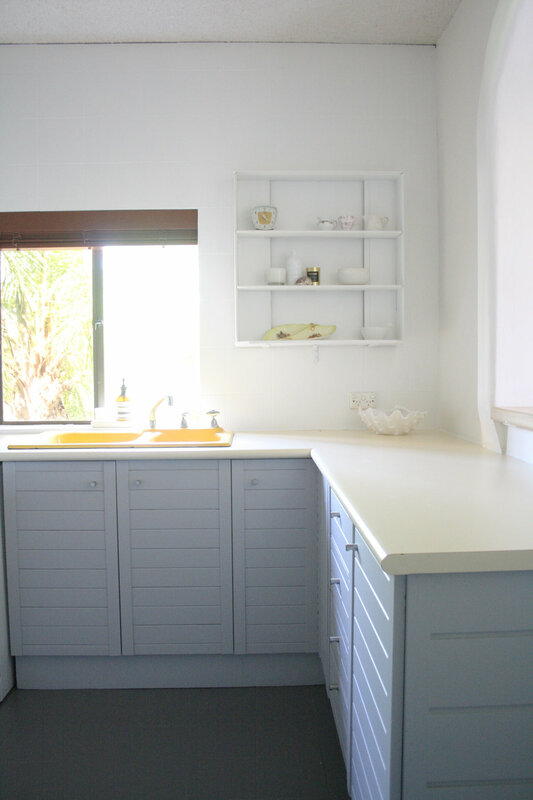 We kept the bench tops, cook top and splash back the same to save on costs. Updating the dining chairs from Hello Trader in black to keep that hint of textured punch in the space and adding black in the rug & cushions so the area flows. We moved the console to the back of the sofa definds the area and offers an element of a ‘centre stage’ piece. 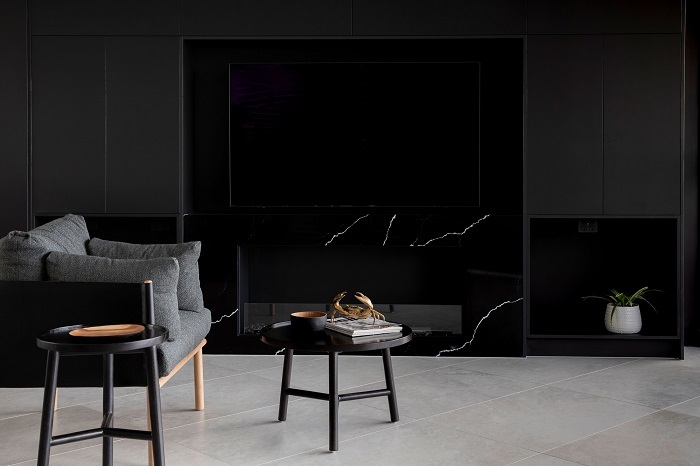 The TV cabinets got a face lifted of new fronts in Laminex Impressions range, so it adds subtle texture and kept the same black lip pull handles as the kitchen keep the same aesthetics through the house. Jenni’s request was to keep the master bedroom soft and relaxing colours. Of cause white was the perfect choice but adding Jenni’s favourite colour of a sage green to add elegance. 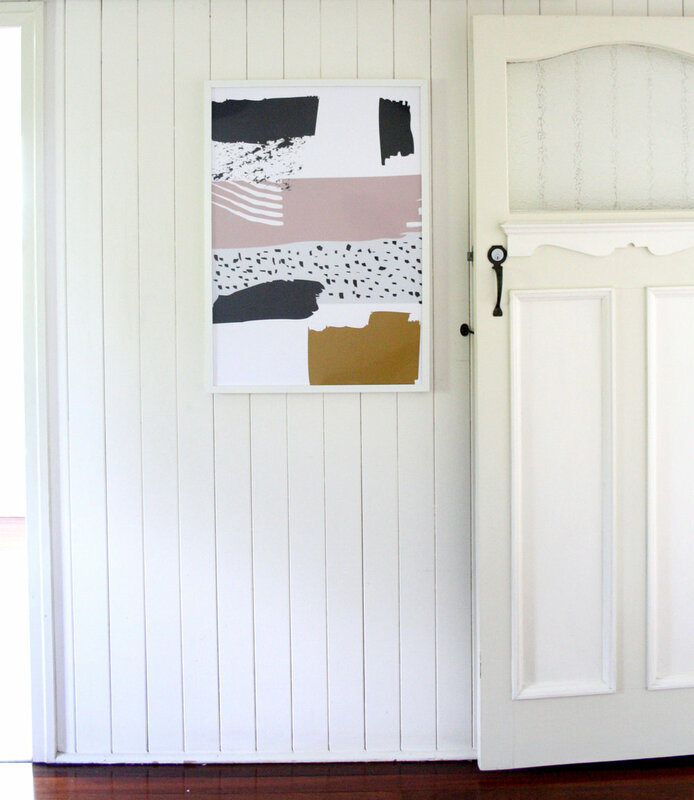 Jenni picked all the art and totally feel in love with the swing over the water print! Perfect don’t you think? It offers such a relaxing feel and with the soft sheer curtains what a lovely match. Jenni also has some stunning antique pieces that we styled to show them off, something that Jenni can admire every day. The collectable crystal bottles sit so proud under the modern round mirror, this just shows how the old and the new work so well together. 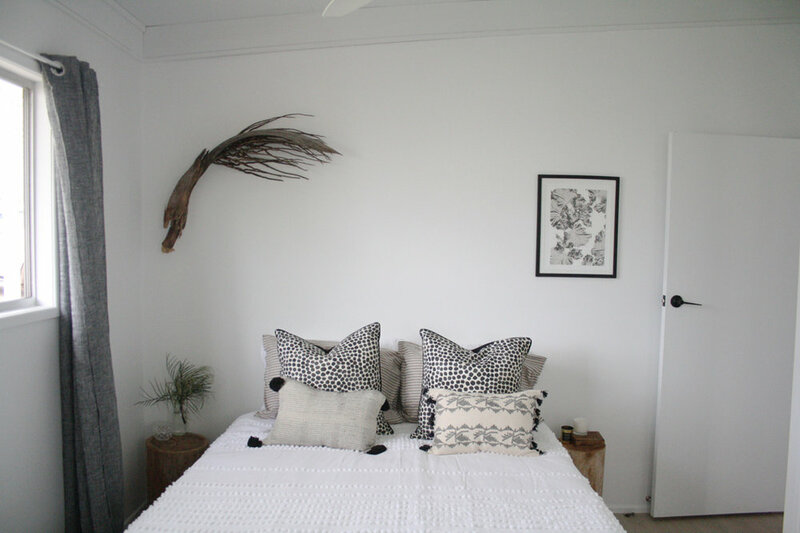 In the spare room we added the bold art and hung it as a bed head, so the piece gets all the attention, we created the remaining room less busy! The art is the “hero” and Jenni’s husband favourite piece, you can see as you walk down the wall way. Perfect compromise. This couple have been to some amazing places around the world and collected post cards and other items that we placed on the moodboard over the desk. We lost the ‘red’ and relaced it with white to keep it simple but effective. The single bed was re-style to act as a ‘day bed’ feel and offers the room to feel more like a office. Jenni has so many love items she has collected and been given from family and friends that they are now on display. Given that the stone tops didn’t need updating we just added new fronts in a charcoal and added the white lip pull handles. This instantly updated the bathrooms and laundry into the now that it looks like they have new bathrooms. 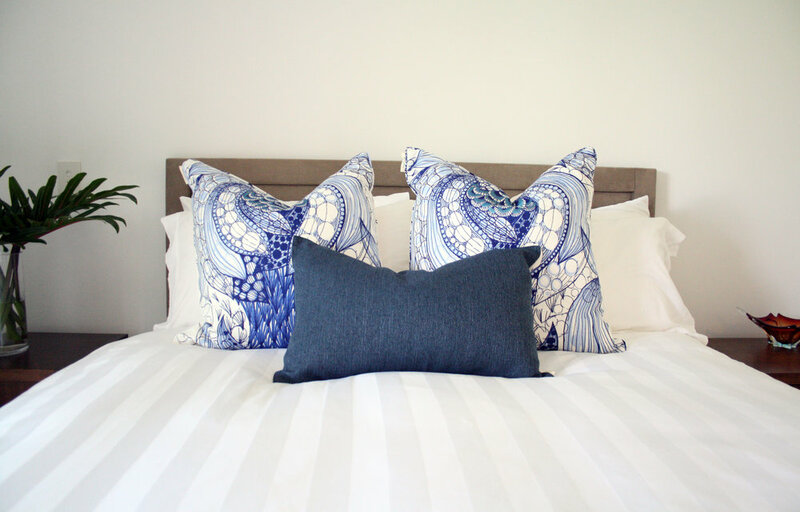 We shopped around for new pattern towels and accessories to add more visual appeal. 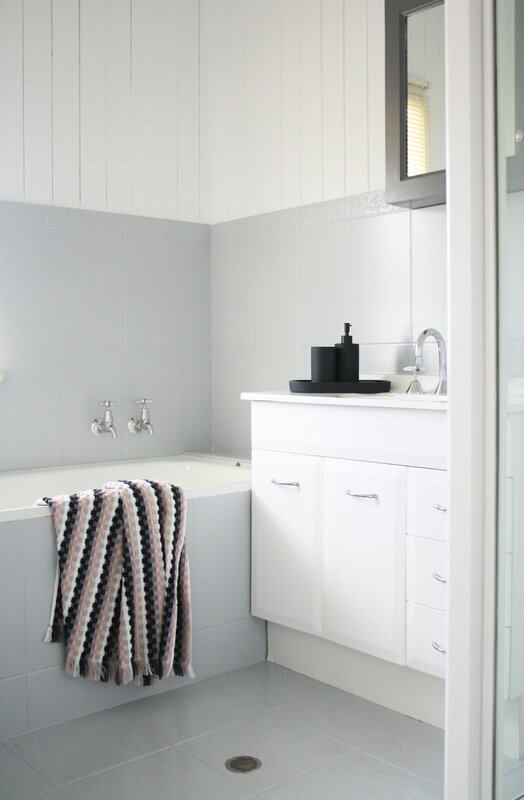 I believe that textured pattern towels offer a space that is better balanced to the block colours (tip for you to use at home). Below is the final look of each space of Jenni's new home. We also had a couple of fabulous days shopping at local stores to finish off her home, some cuttings from my garden and flowers from Campbell and Bradley florist to concrete the style. Finishing off this project and saying goodbye to Jenni was sad, sad that I was not going to see or talk to her as much as I normally do, clients always turn into friends in some way shape or form. 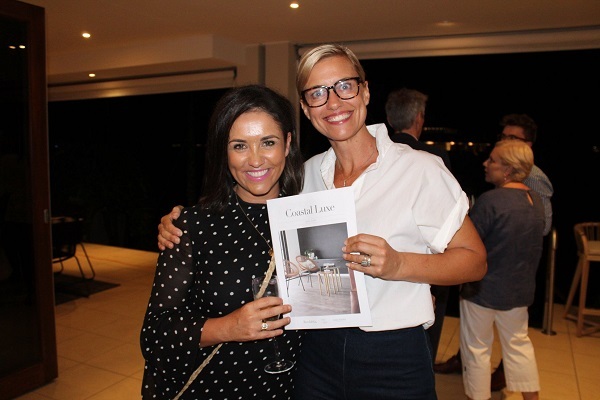 Absolutely loved working with Jenni to freshen up her home and I just know we will stay in touch. You are amazing Jenni! 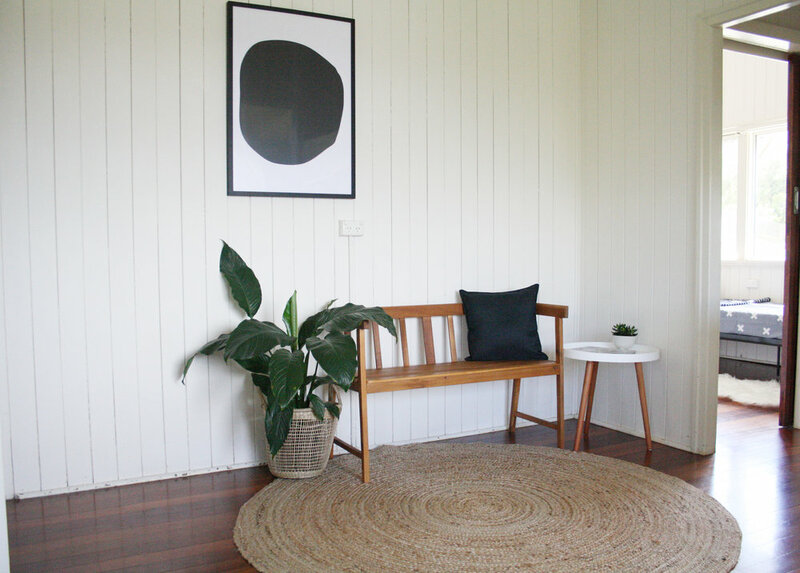 Please note :- Images above styled and photographed by Simone - style.life.home. Please ask for permission to use.